What Are Electric Pressure Cookers? Finding the best electric pressure cookers for RV Living might be hard to do because it’s such a specific area but I am here to help you do just that. It’s what the camping nerd is all about! The idea of pressure cooking is not a new invention. It goes back all the way to the year 1679 when the French physicist Denis Papin was trying to invent a way to reduce the time it took to cook food. He succeeded. He figured out that the water’s boiling point (100 °C, 212 °F at standard pressure) increases as pressure rises. Under standard pressure, the boiling water turns into steam, but when you stop that steam from escaping, it will push down into the liquid and create more pressure, the boiling point of water can then reach a temperature of 121 °C (250 °F), which will cook food faster. It’s an interesting read on the history and the theory of pressure cookers at Wikipedia. So how far have pressure cookers come, almost 340 years since Papin’s discovery? During the 20th century, generations of pressure cookers have come and gone. The most popular one being used today is the electric pressure cooker. Often called Instant Pot, because they make the most popular brand of pressure cookers. All the products I will take a look at today and discuss with you is electric pressure cookers that can make wonderful dinners in a short time. I love to cook, and I love electronics, but when you want to cook in nature with anything that uses electricity, you must know specifics about how many watts it uses and in this case for how long. Will you only be able to use your pressure cooker on a sunny day when your batteries can be quickly replenished? Well, I will do my best to give you the info on pressure cookers, and then it will, of course, depend on your setup. Feel free to leave a comment with any questions you might have. The most general questions will be answered at the bottom in the Frequently Asked Questions, where I also discuss some Power Usage Info. 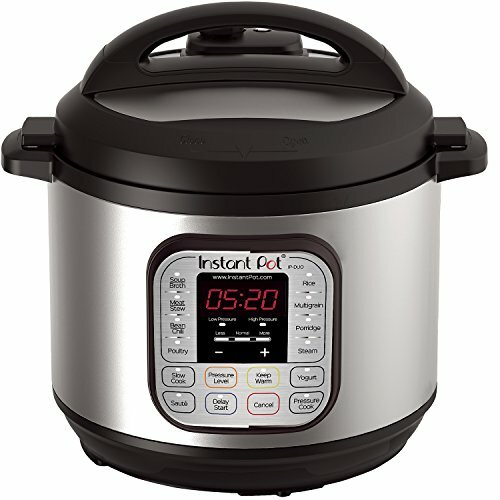 The product in today’s comparison with best TCN Score today will be the Duo Mini from Instant Pot. It’s the only one weighing less than 10 lbs and is rated at 700 watts. The downside is that this one is 3 quarts smaller than the next size in the comparison which means that you’ll most likely not cook a meal for four people or more with it. But if you’re only up to three people, this is a great option. So what does it mean that it’s a 7-in-1 pressure cooker? It means that it can not only pressure cook, but also slow cook, cook rice, saute, steam, yogurt, and warm food. Depending on what you’re preparing, you’ll also have ten built-in programs to choose from on the front of the cooker. Other features include a 24 hours delay start, three temperatures to choose from when sauteing or slow cooking, and up to 240 minutes of pressure-cooking at once. The Instant Pot LUX Mini is a great versatile choice that is small enough to fit in a RV or boat kitchen. Cosori is a company that you might have heard of before if you like kitchen accessories. They make all kinds and have also made this pressure cooker. An 8-in-1 that compared to the LUX Mini can be a hot pot and yogurt maker. It sticks out with it’s 17 smart programs you can choose from on the front which is second to best in today’s comparison. 12-hours delay start, 12 hours of cook time on manual, 6 different pressure levels, and two manual cooking modes (pressure cooking & temperature). 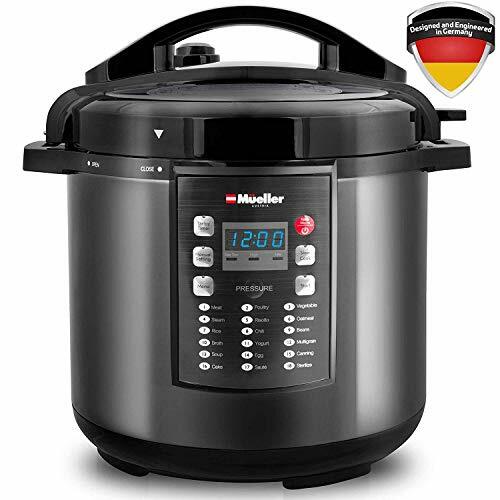 This Germany-based company Mueller delivers the best-looking pressure cooker today. This 10-in-1, 6 Quarts, with 19 (!) programs can cook two dishes at once with the included bonus steel rack, note that this is also possible with the other pressure cookers but not advertised as much. I have answered a question down in the faq about whether it matters how many pre-programmed programs your pressure cooker has. What makes the Mueller extra special are the program buttons for Risotto, Canning & Sterilize. I also appreciate that they include a glass lid for when you want to slow cook food and want to see how the food is doing without removing the lid. The Mealthy Multipot is one that I haven’t seen before that impresses me. It appears that they have thought about the person that is going to use it. First, the display. On my pressure cooker I don’t know if it has built up the pressure and when the cooking has started. The Mealthy MultiPot has a display that tells you when it’s preheating, cooking, and keeping your food warm. It will also show a graph to let you follow the whole process. Second, the accessories. The other pressure cookers come with a raised steam rack for potatoes and vegetables. This one comes with an extra steamer basket in addition to the steam rack. It’s also the only one that comes with silicone mitts. Other than that you will get a ladle, rice paddle, and a measuring cup. Third, small thing but it matters. The power cord is 48 inches long and detachable. 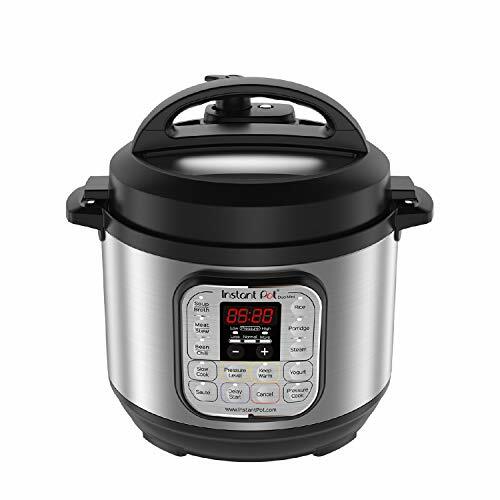 The DUO60 from Instant Pot is their 6 Qt model for families with 4-6 people. 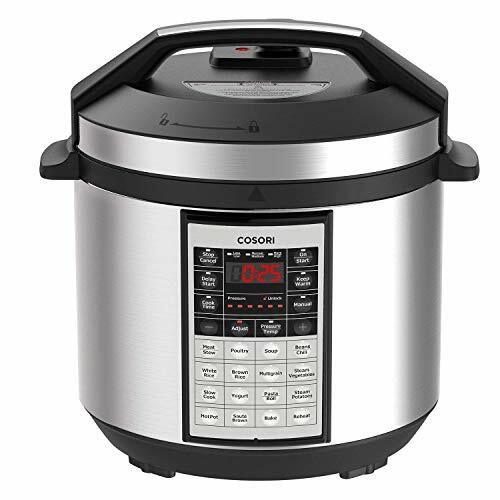 A 7-in-1 pressure cooker with 14 smart programs. Pressure cooker, slow cooker, rice cooker, steamer, sauté, yogurt maker and warmer are the functions. 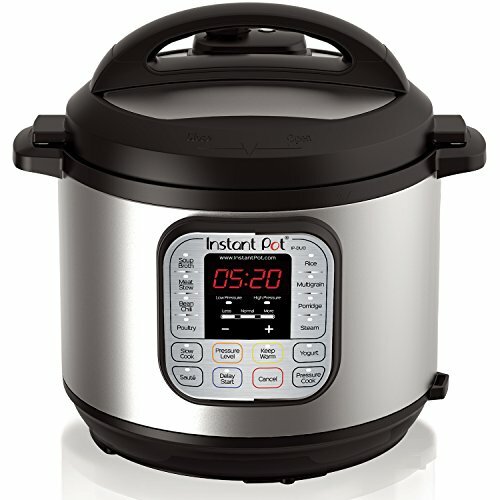 Just like the Instant Pot LUX Mini, you can set a 24 hours delay start. Up to 120 minutes of cook time on manual settings, and 3 temperatures to choose from on saute and slow cook. 10 safety mechanisms will make sure that you’ll cook your food fast and safe. Besides the safety mechanisms, the DUO60 is UL and ULC certified. The stainless steel inner cooking pot has a 3-ply bottom for great heat distribution. Included with the pressure cooker is a steam rack, rice paddle, soup spoon, measuring cup, condensation collector and a recipe booklet. I recommend Googling your favorite dish and add “instant pot” in the end. There are tons of recipes out there for meals that you might never think about cooking in a pressure cooker. The biggest pressure cooker in the comparison today comes from Instant Pot, and it’s made for large families. 8 Quart should be enough to feed more than six people at once. It’s a 7-in-1 cooker with 14 smart programs. It doesn’t differ much from the DUO60 except the size. It uses 200 Watts more than it’s little brother which makes it the most power hungry model in the comparison. 500 Watts more than the Instant Pot LUX Mini. Unfortunately, the power cord on this big model is not detachable. Included with the DUO80 is a steam rack, rice paddle, soup spoon, measuring cup, condensation collector and a recipe booklet. I hope I have helped you in the electric pressure cooker-jungle and that you can now decide what you need. When deciding what electric pressure cooker to buy, the most critical factor to consider is how many people you are planning to feed. While it’s great to have a smaller, lighter, and less power-hungry one like the Instant Pot Duo Mini, a big one can cook you more food. More food means more meals and left-overs if you’re only two people. Starting up the pressure cooker every day might not be sustainable if all the electricity you get is from solar, there will be cloudy days. If you have never tried meal prepping, do it! Second to most important is thinking about what you will be cooking. More features don’t automatically mean a better product for everybody. It depends on the user, and it can be worth it to save on space, weight, and money by getting a cheaper one with fewer programs if you won’t use most of them. If you’re one to three people and only plan on using it once a week – Instant Pot Duo Mini 3 Qt is a great little pressure cooker that will get your dinner done. From a well-known brand. I believe a 7-in-1 is enough for most families and you get a lot of kitchen accessories in this small package. Remember that a 6 Qt uses 35% more energy than this 3 Qt, so as long as you’re not planning on cooking large amounts of food, this will be a great choice. If you want to be able to cook for up to six people and appreciate features – Each 6 Qt we have looked at today has impressed, except the Instant Pot-model. Therefore it’s hard to choose a winner. I would personally go for the Mealthy MultiPot 6 Qt 9-in-1 for its screen and included accessories. But if you want more smart programs, it’s between the COSORI and MUELLER. If you cook for more than six people – If you’re cooking for six people or more, I recommend the Instant Pot DUO80 8 Qt 7-in-1. For a big meal, the 7-in-1 with 14 smart programs will likely be enough. If a pressure cooker is rated at 1000 Watts, will it use 1000 Watts during the whole time it’s cooking? Longer answer: A pressure cooker can cook the food faster by raising the boiling point of water. When the cooker has reached this point, it’s pretty much done, and now the food just needs to be in there for long enough to get cooked. What this means in power usage, is that a 1000 Watts cooker will use that much for as long as it’s heating up and building pressure. When reached, it won’t have to keep heating up so it will start using less power. A 6 Qt usually only uses around 20-50 watts while the food is cooking. If you’re cooking for longer, it might have to heat up again, then the power usage will spike, and then go down again. This is also true if you’re slow cooking. Depending on your temperature setting (low/high etc. ), your pressure cooker will know when it has reached the intended temperature. It will then fluctuate between heating and not heating, using more and less power. I have had my pressure cooker for almost a year now, and we use it every week for different meals. I have to be honest and say that I was worried about safety in the beginning, it felt scary to have a pressure cooker going in the kitchen. But as with most other things, you get used to it, and you realize that it’s safer than you thought. With all of these safety features, and so many pressure cookers being sold, there’s a really tiny chance that yours would malfunction and cause any damage. Follow the instructions that come with your pressure cooker or it will most likely not cook any food for you, simple as that! Does it really matter how many pre-programmed programs my pressure cooker has? 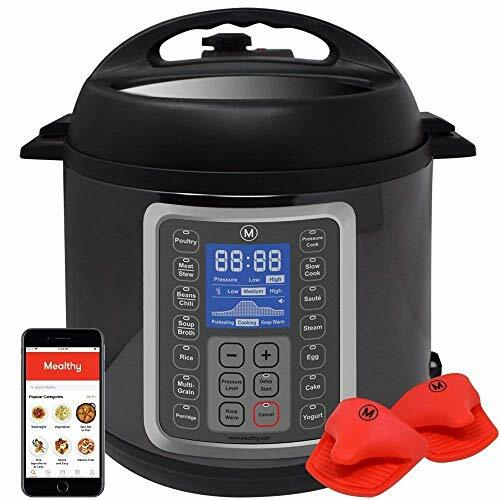 The so-called smart programs on most electric pressure cookers take care of four parameters: heating intensity, temperature, pressure, and duration. If you push the rice button, your pressure cooker will know how fast it should heat up, the temperature it should be cooked in, under how much pressure, and for how long. That’s all it does. Now, will you not be able to cook rice unless there’s a rice program? No, you will. But you will have to figure out the parameters on your own. A lot of pressure cooker recipes helps you with this and tells you what you should set up through manual mode. Sometimes doing it manually will cook the food better because the program doesn’t know what kind of rice you put in, and how much. What is so great about pressure cookers? Pressure cookers will cook the food for you faster while using up to 70% less energy. Modern pressure cookers can also do all kinds of cooking. Maybe in your kitchen today you have a rice cooker, a slow cooker, a yogurt maker, and a steamer. What if I told you that one pressure cooker could do all of that? Okay, now I sound like a salesman, but I have had one for almost a year and I love it. Especially if you live in an RV, and have limited space. It’s such a great solution with so many choices and since they’re so popular nowadays, there are so many recipes online and books that focus specifically on pressure cooking recipes. Then make cooking easier for the person that cooks for you!